Years ago I bought this really neat panel of a Sue Bonnet Sue fabric. I had set it aside knowing that some day I would figure out a way to showcase it. I liked the colors, the scene of each panel piece, and just the overall whimsical feel of it. So that was my starting point. From there I thought it would be fun to pick out a few other favorite fabrics and showcase those in the same way, but changing the size of the squares as needed. To separate the different fabrics, I made a bunch of the blue and white checked rows. They kind of remind me of a film strip. 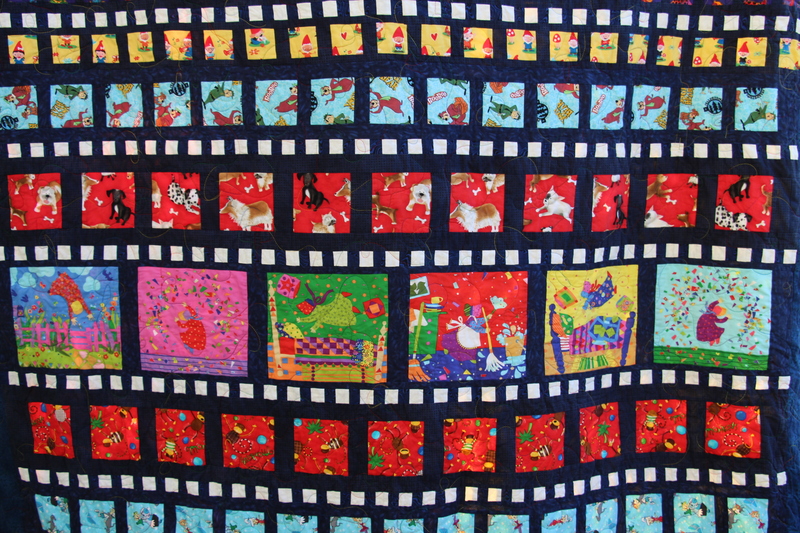 I like how this quilt turned out – the funny part is that this quilt is really, really long! It is perfect for an NBA player though – there is no way their feet would stick out the bottom. Too bad I don’t know a single NBA player – and more importantly, one that would love Sue Bonnet Sue fabrics. Tee-Hee! And lastly my favorite photo bombers! You keep coming up with new and exciting quilts! Thanks Dad 🙂 I love the picture of Timmy in this post – he just looks so happy and shiney! The design is very clever. I immediately thought it looked like film strips and it made me think about old cartoons. I always enjoy seeing pictures of your handsome boys! I love the varied sizes of the squares. It creates so much interest and movement! Hi Kelly – thanks! 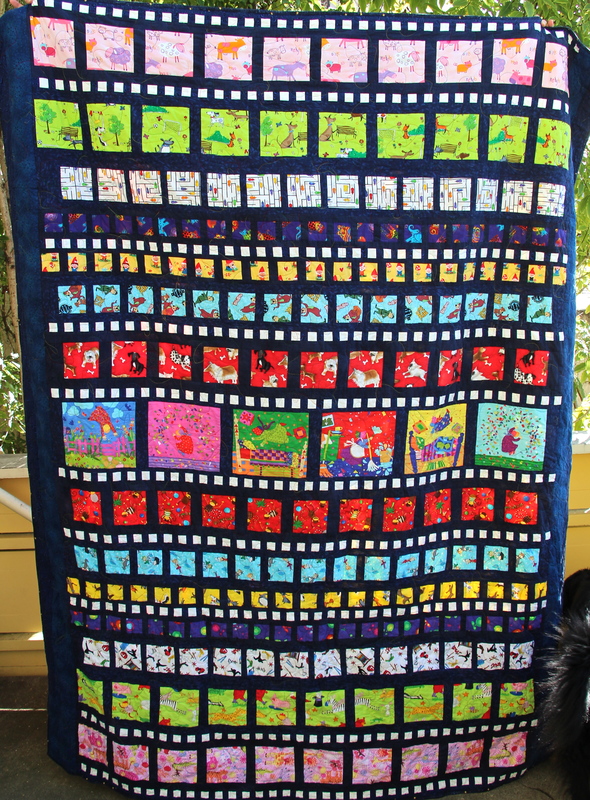 Your Stepping Stones quilt was really fun to look at this week. I think the gorgeous blue sky in the background of your photo showed off your quilt beautifully! I also like the orange binding! That was different and eye catching. It looks wonderful. A perfect way to show off these lovely fabrics. Hi Karen – thanks 🙂 I just love that Sue Bonnet Sue fabric – I wish I had bought more of it!! I really like this – especially the different sized squares. 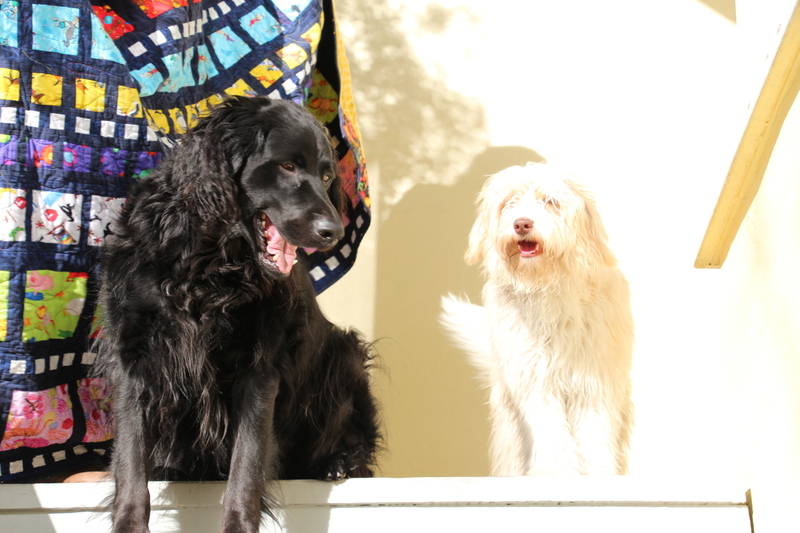 And the dogs too – I have a couple that seem to appear in quilty photos every now and then! I’m making a similar quilt and am stuck for ideas of how to quilt it – how did you do yours? Hi Judy – thanks! 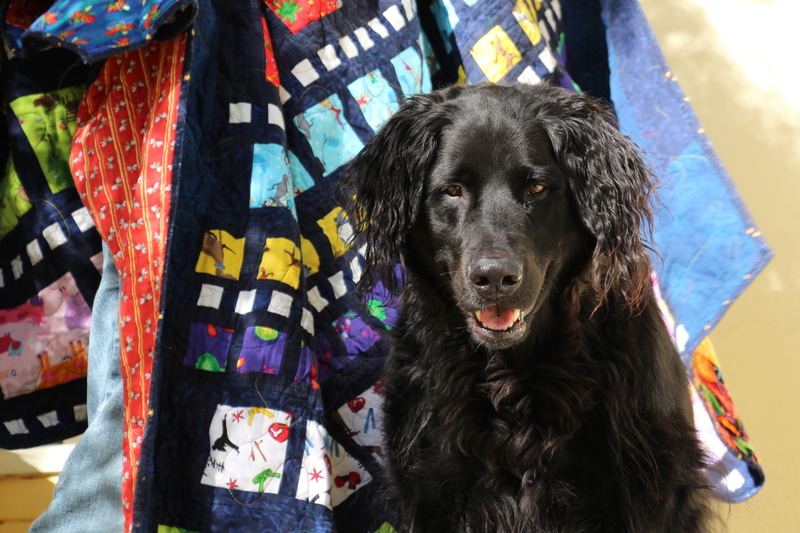 My friend does all of the quilting for me – she is really good! The quilting is a pattern of simple loops with some little mushrooms as well. She added the mushrooms because one of the fabrics has gnomes all over it, so the mushrooms just seemed to fit. I was just looking at your garden blog and it looks just beautiful! What a neat project/hobby for you and your husband to share! That’s a big quilt! Love the film strip effect. Thanks! I really like the pillows you’ve been working on. My husband would get a kick out of the wine pillow and I like the Luckenbooth cushion! I really like the way it is laid out like film strips. And so vibrant – lovely work! Thanks Gemini! I was just looking at your blog as well. 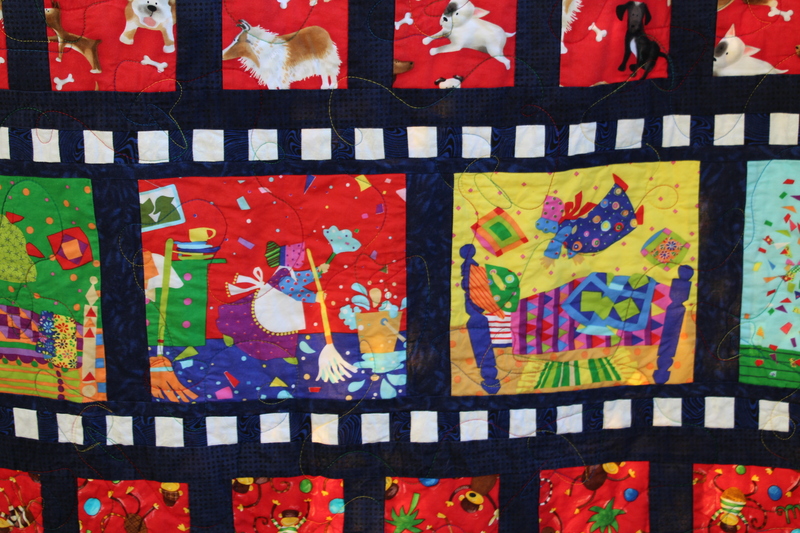 The quilting on the blocks of your most recent post is absolutely stunning! WOW! I look forward to seeing more of your work! 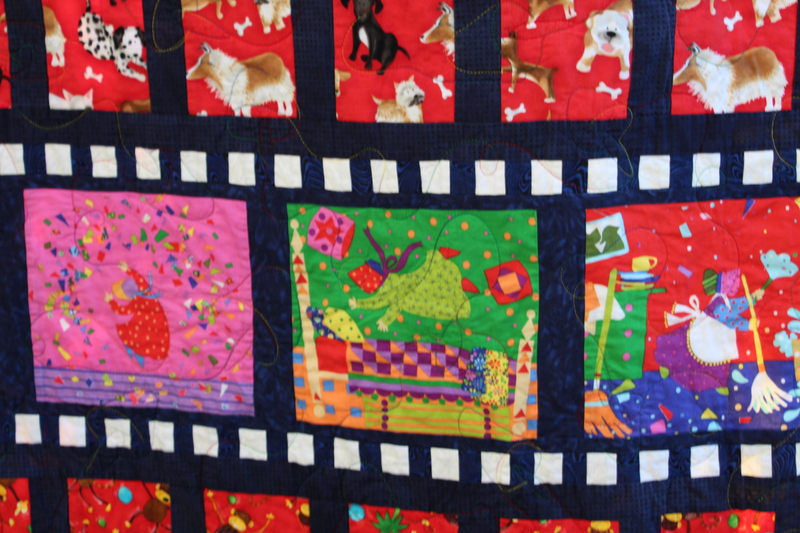 Sue bonnet has a special place in my heart<3 What a clever,clever quilt! !